Been busy the past couple of weeks creating a new Grunge Wordpress Theme, this will be free to download soon. This new Wordpress Theme is created using the brushes and images featured on my Photoshop Brushes site. Also been working on some twitter Icon design ideas, will be adding more goodies including more free textures to the PSBrushes site soon. 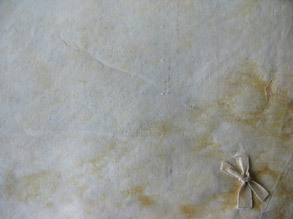 Just added a new selection of Parchment and aged paper texture wallpapers (2000 pixel wide) to the site, got loads and loads of textures that I have collected, will be adding loads more of these soon. 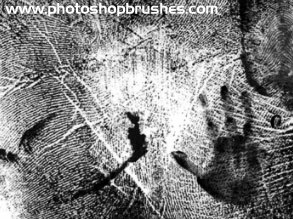 Just released 14 new, very large textured photoshop brushes (2.86 meg), the new ones are Fingerprint Brushes with two very large textured handprints, again used these to quickly create a new twitter background, give you an idea of what they can look like when used. Also featured on the page are a smaller selection of hand prints. Another 18 free photoshop brushes, these new ones are made from Coffee Stains and coffee cup marks, another big set, really like this new set. 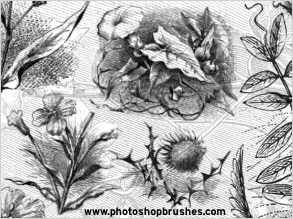 This latest Photoshop Brushes set features fourteen Floral Photoshop Brushes, these are taken from a victorian book illustrations. I have loads more Corner Shaped Letters which are still to be added to the site, these new ones will make a great set. looking forward to releasing these soon. Hope you like this latest Photoshop Brushes set. 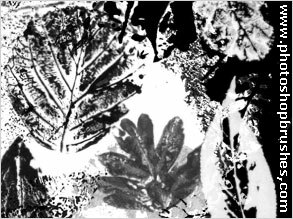 This is the latest Photoshop Brushes set featuring new large Leaf Print Brushes, a good selection of eighteen different shaped leaves in this set, long leaves, rounded leaves, some quite bold and some subtle. Should be good for adding grungy textures to images and adding floral background textures. The latest Photoshop Brushes set featuring fifteen Hand Drawn Arrows. These are all hand drawn in pencil and vary in style, some are just line drawn and some have shading applied to them, should be a good set to help create doodle, sketchy backgrounds. This is the latest set featuring seven very large (1.61meg) Aged Rivet Heads. These new Photoshop Brushes have great textures and some also have peeling paint, great for adding a grunge style to an image. Below are a large selection of my Free Photoshop Brushes for free download all the Designs are free to use for commercial and non commercial use, please credit this web site or link to it from your site, for more details and tiny banners see the resources page. 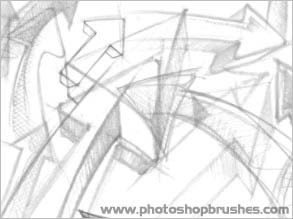 All the Photoshop brushes featured on this site are created in Adobe Photoshop 5.5 and the newer additions to the Photoshop Brushes site are created in photoshop CS, which means they will work with all later versions of Photoshop for both Apple mac and PC. 20/09/09 - New big Weasel skull brushes for free download. Twenty one photoshop brushes scanned from a kettle instruction manual. Distort images and add scratch effect to them with this new eleven brush set. A selection of thirteen blood splatters, some large some medium sized. Hand Prints, finger prints and one foot print. Nine new photoshop brushes created from a selection of my illustration work and sketches. Seven new grunge corner brushes. Eight new Photoshop Brushes taken from close up digital photos of the Sheep's Skull set, pretty grungy. A set of two sheep head brushes created from a skull recently found while climbing in Scotland. A set of five Beetle Illustrations varying in size. A set of two large moths photoshop brushes. A set of three large illustrated sea creature brushes. A set of eleven featuring various Butterflies from around the world and a couple of beetles. Another fourteen stars and highlights. Ideal for adding a bit of sparkle to a shiny object. Fourteen new ones based on the Alchemy Font, distressed and grungy. Engineers drawings of the first world war 1 tank. Eight grunge lines, quite grunge based. Created from packaging featuring bar-codes, postal stamps and logos. Featuring two second class postal franks, bar-code, recycling logo. 22/09/09 - Five very large Crow skulls photographed at different angles, can also be flipped. Eight 3D hand drawn Photoshop Graffiti brushes. Based on crop circle photographs. Three large images of cat skulls. A selection of nail images from different angles. Rifle Bullets, shotgun cases and Bullet heads. Crow heads side view and front view. Thirteen new grunge versions in various sizes. Fox skulls, created from digital photographs. Power tool Icons and diagrams. Leaves from a Ivy plant. Screws, bolts and fixings as displayed in Autocad. Two concrete textures, idea for aging images. More tank drawings featuring text and plan drawings. Featuring a selection of different fonts. Dirty grunge brushes set 1. A selection of Icons from Mac OS and Windows. A selection of cracks and Photoshop dirty textures. Please note I do not allow other Web sites to link directly to the zip files or the images on this site, if you do need to link to a set, link to the html page, not the file itself.